Time：22017/5/11 Posted：Ionkini Technology (GZ) Co., Ltd.
An ion is simply a particle that is charged, either negatively or positively. The ionizer creates negative ions which seek out positively charged particles, such as dust, dander, bacteria, pollen, mould, smoke, chemical vapours, and other allergens. Once the positive and negative ions are bonded together, they become too heavy to float, and no longer affect the air quality of the surroundings. Negative ions are created in nature by the effects of water, air, sunlight and the Earth’s inherent radiation. Negatively charged ions are most prevalent in natural places and particularly around moving water or after a thunderstorm. That taste in the air and feeling you get at the beach, near a waterfall or after a storm is your body being saturated in the benefits of negative ions. 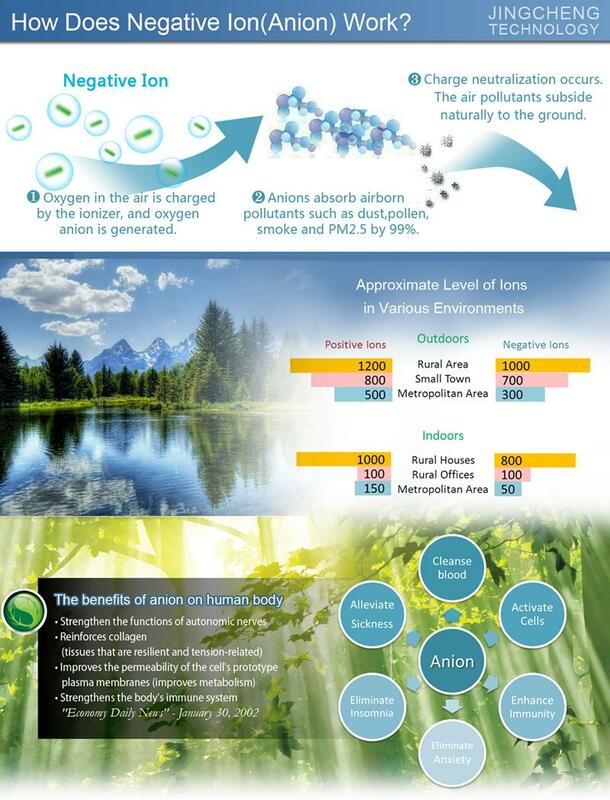 - Urban areas typically have much lower concentrations of Negative Ions in the air than rural areas. - Ionization is mandatory in many European and Russian Hospitals. - In March of 1999, Good Housekeeping Magazine had its engineers test an ionizer by using a smoke test, and found that it cleared out the smoke in a tank. - A recent study by the U.S. Dept. of Agriculture found that ionizing a room led to 52% less dust in the air, and 95% less bacteria in the air (since many of the pollutants found in the air reside on floating dust particles).